Cuplock Systems is well known Scaffolding Systems for quick locking the scaffoldings by using two cup shaped locks. Cup lock system, also known as Cuplock systems is widely used in scaffolding industries because of its easy-to-use and highly Versatile nature. Cuplock / Cup lock is a unique node point connection allows up to four horizontal members to be connected to a veritical members in one single action - without the use of nuts and bolts or wedges. The locking device is formed by two cups. Single node point action of unique locking make 'cuplock/Cuplock' a fast, versatile and optimized system of scaffolding for scaffolding for construction, demolition and maintenance projects throughout the globe. Just a simple locking cup at each node point on the standards enables connection of the ends of up to four members in one locking action. Cuplock System has a proven performance history on an extensive number of sites, meeting the requirements of the various statutory bodies. Widely and Versatile use in construction, demolition or maintenance projects for any type of structure i.e. straight or curved. Lightweight but high loads carrying capacity. Cuplock spigotted standards are manufactured from 48.3mm O.D. tube. They have cup joints at 500mm intervals. The captive mobile top cups are designed to endure rough site handling and welded bottom cups are made from high-quality steel. Integral spigots are provided at the top of each standard for making vertical connections. The spigots and the base of each standard incorporate 11/16mm dia. holes to enable use of locking pins to join standards where necessary. The Ledgers are manufactured from 48.3mm O.D. tube with forged steel blade ends which locate into bottom cups of the standards and are locked in place by the corresponding top cups. Ledgers are available in various lengths to provide the desired grid dimension for scaffolding or formwork. Transoms are fabricated from twin structural angles fixed back to back with a drop forged blade attached to each end. The 1.8m and above Transom has an additional web member welded below the flange section for added strength. The transom blade locates into a bottom cup and is locked in position by the top cup. 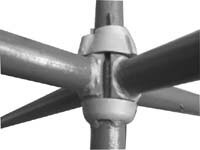 The outward standing bottom leg of the angles supports the steel planks in a captive manner. Available in various lengths to suit scaffolding and formwork applications. Omega Transoms manufactured from press bent section with flange type extensions on both sides provides a strong support for working platform with Cuplock steel battens. For use where distance between standards exceeds the span of scaffold boards Cuplock intermediate transoms Available in various lengths. Similar to intermediate transoms, inside board transom is used for providing facility for a single inside board platform. The Return Transom is used at the end of a scaffold run where it meets another scaffold running at right angles to it. The U-shaped return section of the transom hooks over the ledger of the adjacent scaffold, closing off the gap between the two scaffold. For diagonal bracing of scaffolding a range of longitudinal braces made with swivel forged blades at either ends to be fitted into cups of Cuplock standards are available. 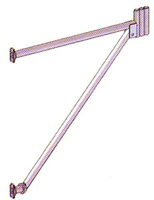 This item is used for providing support to decking or formwork at edges. This frame has ledger blades to be fitted into cups of Cuplock standards at one end and with provision for accepting jacks in three positions at the other end at 1.2 m, 1.25 m and 1.3 m from centerline of the standard. It is fixed on the main vertical supporting beams and can avoid separate vertical for supports of slab form work. Hop-up Brackets are designed in omega sections as well as in tubes sections for placing battens with provision of forged blades to be fitted with Cuplock standards by cup joint. Omega Hop-up brackets are available for single board, two board and 3 board allocations. Scaffolding bridging item are used to provide working platform complete with necessary guardrails for vehicle passage. The Screw Jack provides a method of jacking which can be used at either the top or bottom of a scaffold structure. It is used in conjunction with Forkheads, Socket Base and Drophead Adaptors. The Socket Base is used in conjunction with the Universal jack and is drilled to allow for the insertion of a securing bolt if required. The dimensions are as mentioned. The Drophead Adaptor units provide for the easy conversion of Dropheads from the Waffle and Trough or Metriform Support Systems for use with Cuplock.